It makes the most of big spaces and it is highly resistant. The full Mezzanine TL 30, with metallic structure and wooden floors, creates spaces up to 30m² and has a load bearing capacity up to eleven tons. 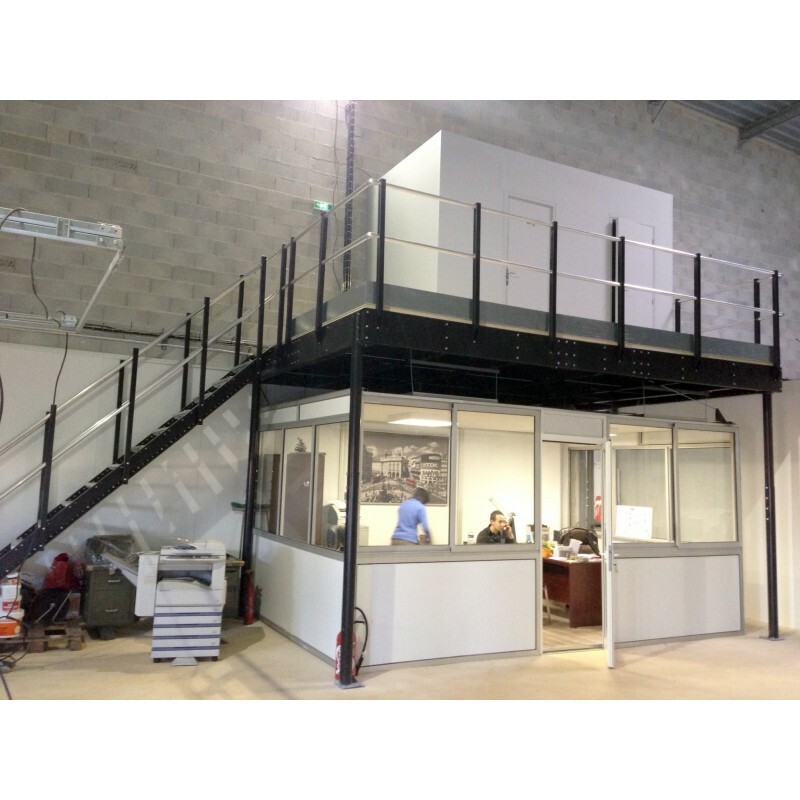 Its excellent finishes make it the ideal mezzanine for converting an industrial space into an elegant and versatile professional space. You can install the metal mezzanine TL 30 yourself without construction works, and start using it instantly, as the full TL30 kit comes with all the accessories. Mezzanine TL 30 kit, extendible from 14 up to 30m². Long Straight Stairs L with handrails. Railing L for a complete comfort and safety (modular kit 2 meters long. It can be extended using the Railing Extension Kits) for total comfort and safety. If you want to install the stairs inside the mezzanine, it is necessary to acquire the Beam for interior stairs L kit. The Mezzanine TL 30 with long straight stairs L is a metal mezzanine extensible up to 30m². Robust and strong; it has a maximum load bearing capacity up to 11 tons. Ideal for taking advantage of large surfaces, it offers excellent results in industrial spaces and at homes as well, thanks to its elegance and the quality of its finishes. Our customers have installed the metal mezzanine TL 30 in industrial units, lofts and studios tailored to the most demanding needs. The fixation of the mezzanine depends on its configuration and on the place where it is installed. It is necessary to stabilize the mezzanine as shown below. Die Bühne ist noch nicht aufgebaut. Eine detaillierte Aufbauanleitung wäre wünschenswert. Vielleicht könnten Sie mir noch etwas per E-Mail zukommen lassen. nach anfänglichen bedenken haben wir die Lagerbühne bestellt. Die Ware ist pünktlich hier eingetroffen. Das Material ist vollständig angeliefrt worden. Ich bin sehr zufrieden. Die Entscheidung war richtig. Pre-sales support was fantastic. Delivery was spot on time. The product is very robust and exactly as hoped for. It took 6 of us 12 hours to put up though as it is very big and heavy, so make sure you have enough people to help out if ordering the large one.